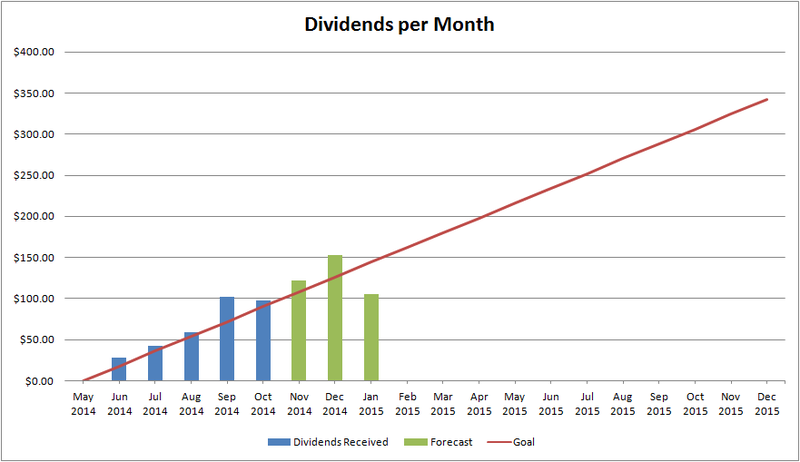 Since I am a picky planner, I prefer having consistently increasing dividends month after month. My current dividend picks favor more dividend payers in Mar/Jun/Sept/Dec months. My Jan/Apr/July/Oct months are the weakest. Even though I have a preference in picking stocks that will even out my distributions every month, I will still prioritize good deals over preferred planning (such as the very low price of CVX and XOM in the last couple of weeks). November … ,,, December …. January . ,.. February .. The green bars represent the forecast and the blue are the ones already received. The Nov & Dec guidance appear in line; however, the Jan forecast is lagging. February is not shown since it's essentially the same as October. Presently my Oct/Jan month is heavily tobacco. I prefer avoiding the financial sector which are stocks such as BNS and TD. For the month of January I am eyeing ITW, KMB, RAI, MKC, PNY, and KRFT. I have already recently added to KO. With my recent purchases in low yield growth stocks, I need companies that have higher yields. RAI, KMB, PNY & KRFT fit the requirements. However most of these appear expensive aside from KRFT at the moment so I am willing to wait. This purchase doesn't have to be made until the ex-dividend dates which are in early-mid December. I am presently eyeing HCP, PG, GIS, and YUM. To satisfy my preference for high yield, I believe the order of priority will be HCP > GIS > PG. Of the three, I believe GIS has the best value. PG looks overpriced. T, VZ, HCN, OHI, KMI/KMR, and CLX are attractive secondary options. I do not want to load anymore in telecom (T/VZ). For REIT I will take HCP over HCN and OHI due to HCP being the dividend champion. I do not want to overload my position any further in the Kinder family (KMI/KMR). And CLX has too much debt. The following stocks above have to be purchased before their ex-dividend date which is usually some time in early to mid January. End of the year goal reached 1 month early!